13 Copyright © Oracle Corporation, 2001. All rights reserved. Controlling User Access. 8 13-8 Copyright © Oracle Corporation, 2001. All rights reserved. 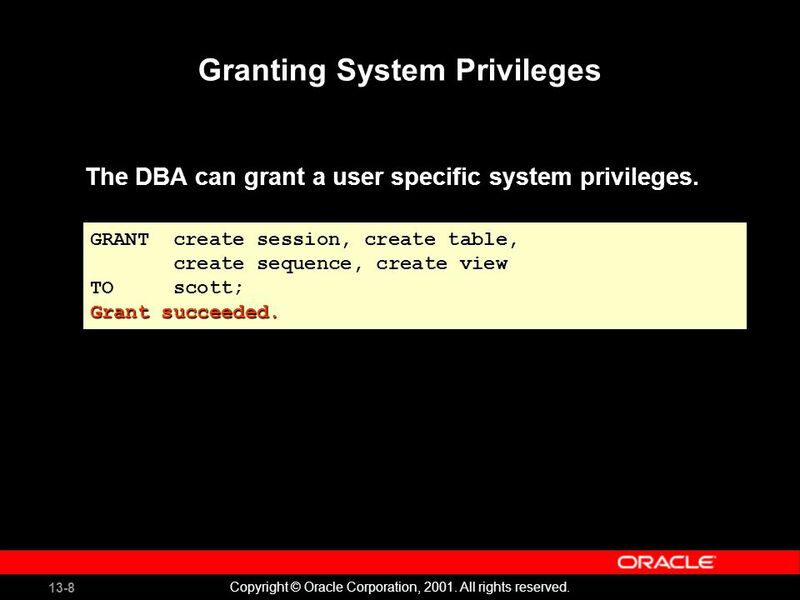 Granting System Privileges The DBA can grant a user specific system privileges. 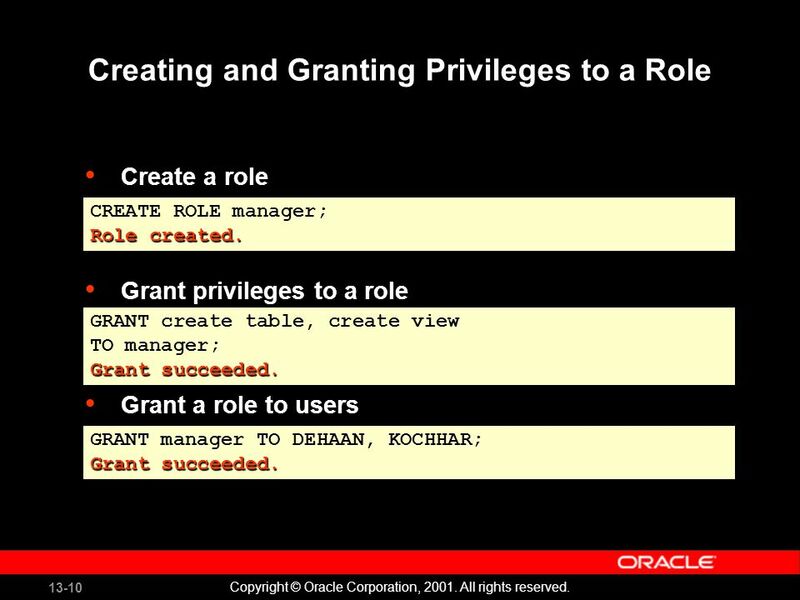 GRANT create session, create table, create sequence, create view TO scott; Grant succeeded. GRANT create session, create table, create sequence, create view TO scott; Grant succeeded. 11 13-11 Copyright © Oracle Corporation, 2001. All rights reserved. 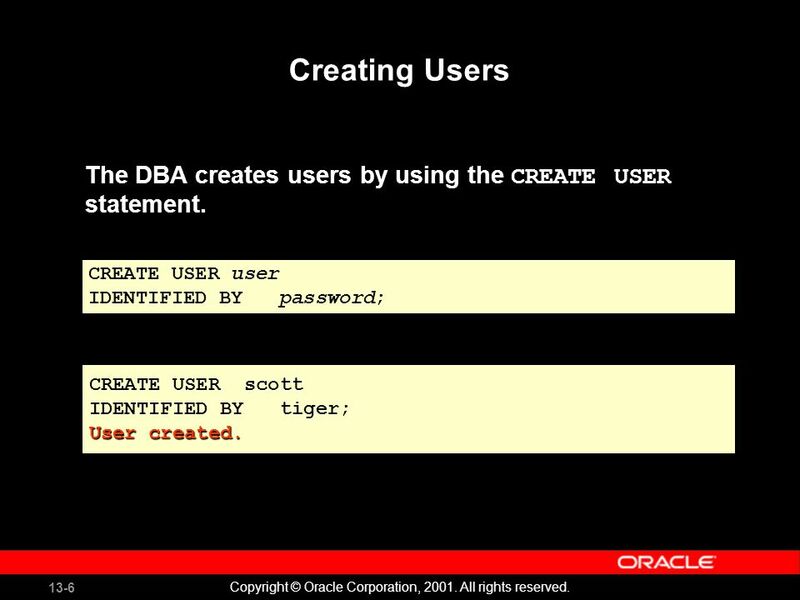 Changing Your Password The DBA creates your user account and initializes your password. 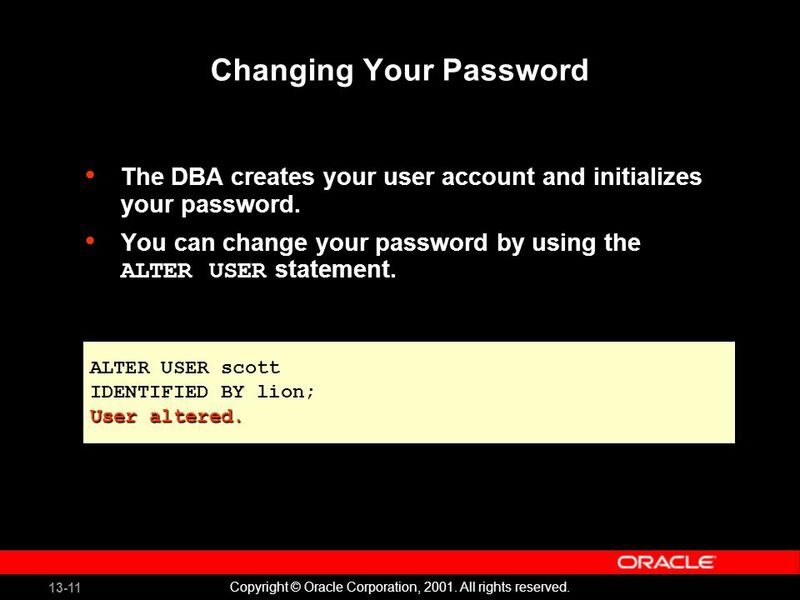 You can change your password by using the ALTER USER statement. ALTER USER scott IDENTIFIED BY lion; User altered. 14 13-14 Copyright © Oracle Corporation, 2001. All rights reserved. 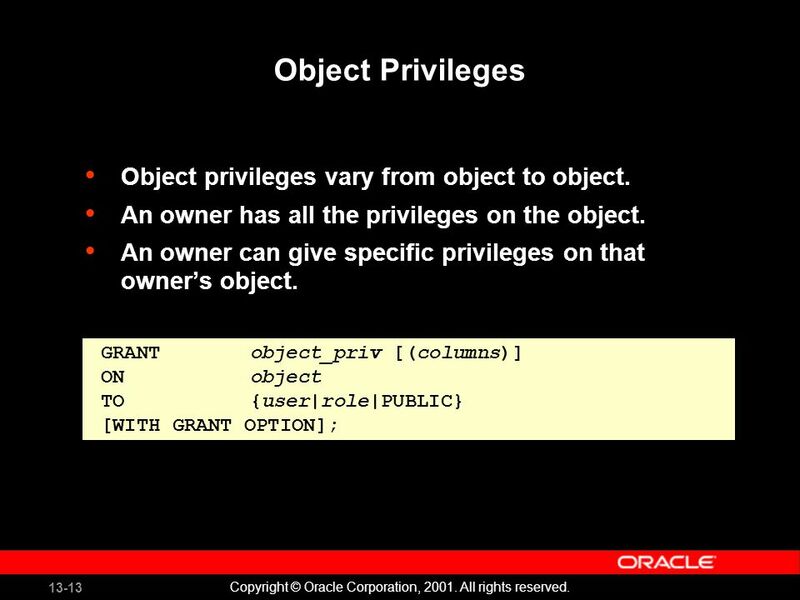 Granting Object Privileges Grant query privileges on the EMPLOYEES table. 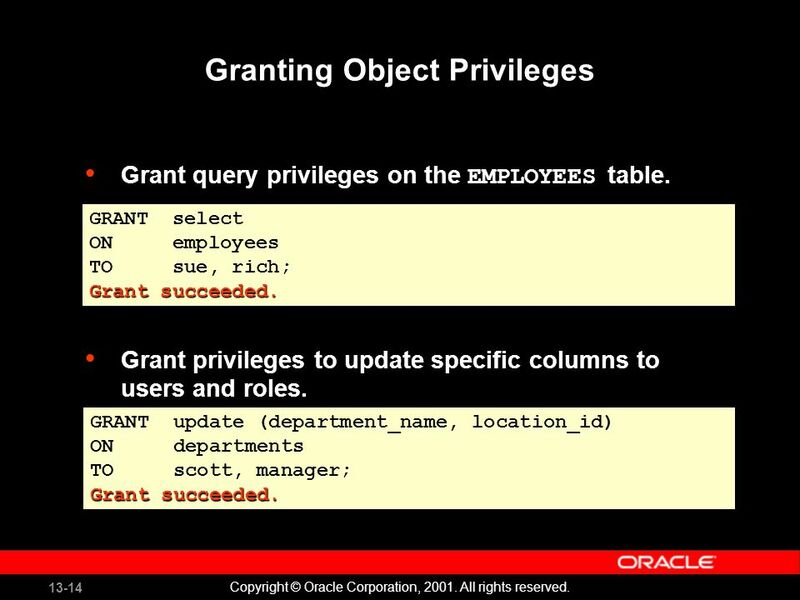 Grant privileges to update specific columns to users and roles. GRANT select ON employees TO sue, rich; Grant succeeded. GRANT select ON employees TO sue, rich; Grant succeeded. GRANT update (department_name, location_id) ON departments TO scott, manager; Grant succeeded. GRANT update (department_name, location_id) ON departments TO scott, manager; Grant succeeded. 15 13-15 Copyright © Oracle Corporation, 2001. All rights reserved. 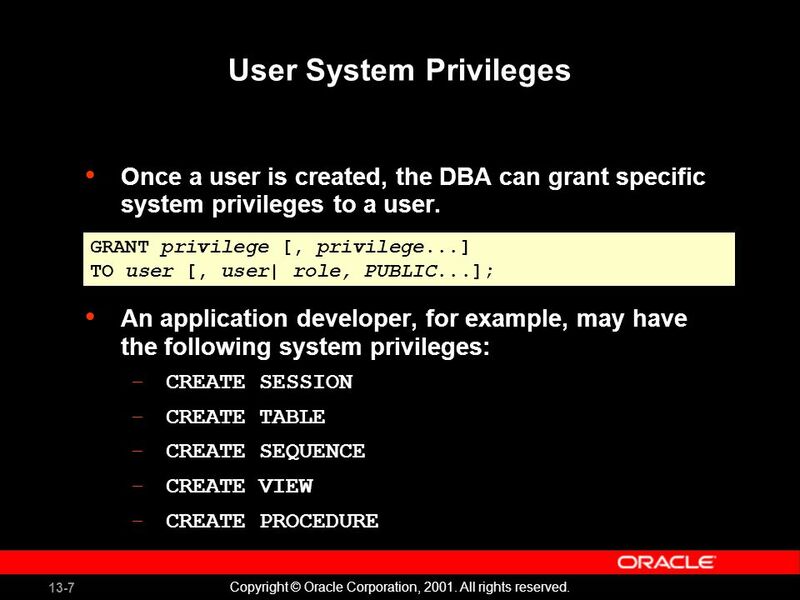 Using the WITH GRANT OPTION and PUBLIC Keywords Give a user authority to pass along privileges. Allow all users on the system to query data from Alice’s DEPARTMENTS table. GRANT select, insert ON departments TO scott WITH GRANT OPTION; Grant succeeded. GRANT select, insert ON departments TO scott WITH GRANT OPTION; Grant succeeded. GRANT select ON alice.departments TO PUBLIC; Grant succeeded. 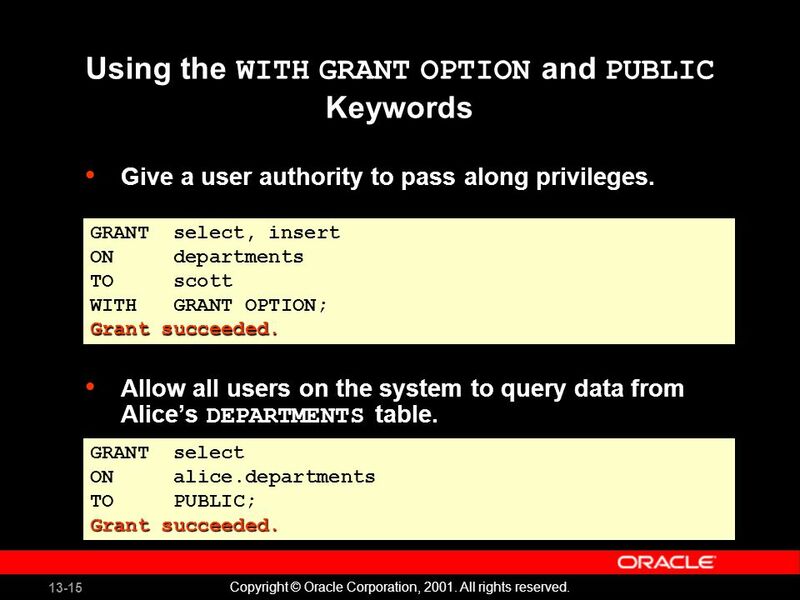 GRANT select ON alice.departments TO PUBLIC; Grant succeeded. 18 13-18 Copyright © Oracle Corporation, 2001. All rights reserved. 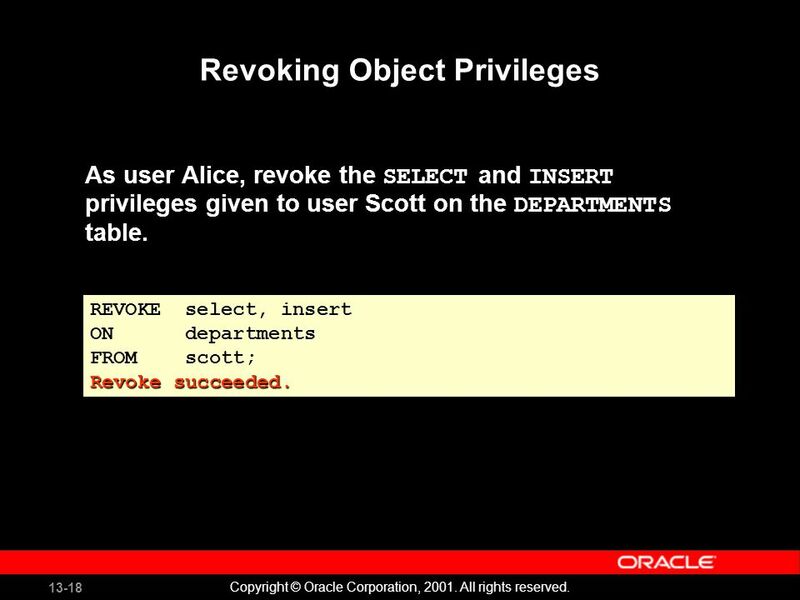 Revoking Object Privileges As user Alice, revoke the SELECT and INSERT privileges given to user Scott on the DEPARTMENTS table. REVOKE select, insert ON departments FROM scott; Revoke succeeded. REVOKE select, insert ON departments FROM scott; Revoke succeeded. 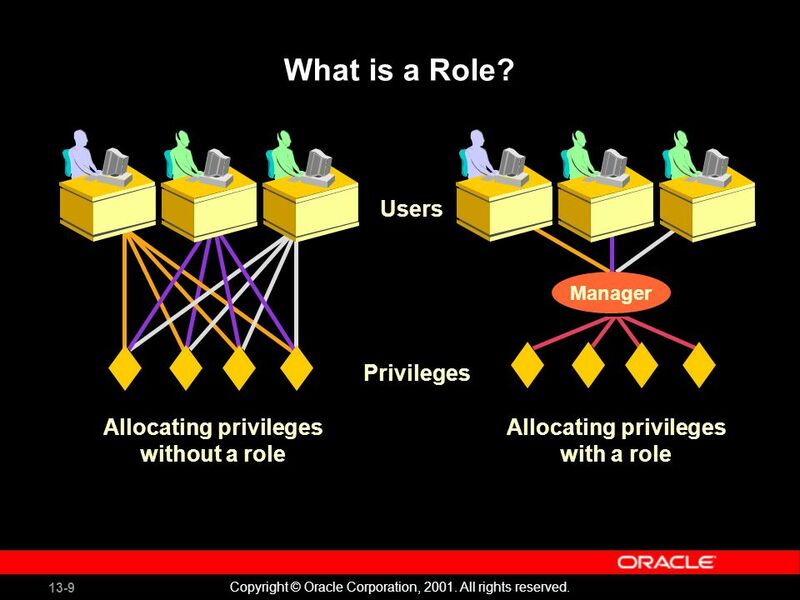 Download ppt "13 Copyright © Oracle Corporation, 2001. All rights reserved. 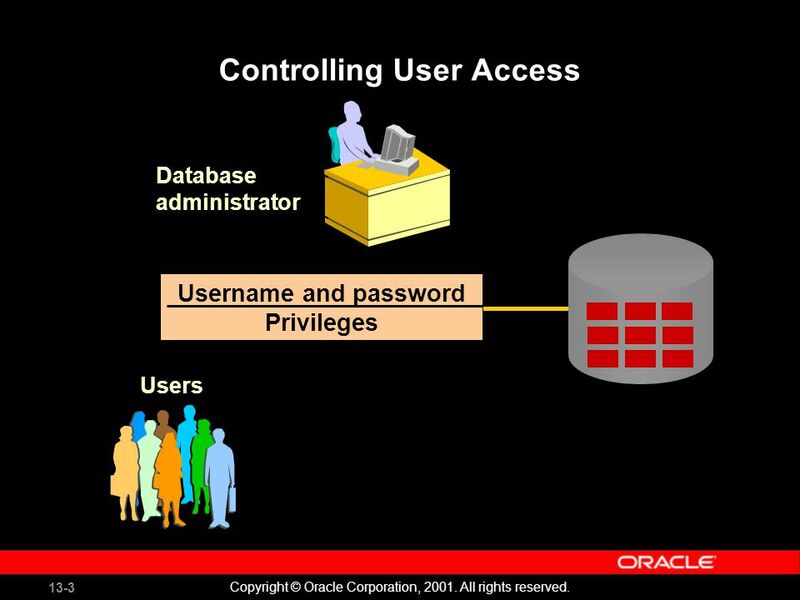 Controlling User Access." 12 Copyright © 2005, Oracle. All rights reserved. Query Rewrite. 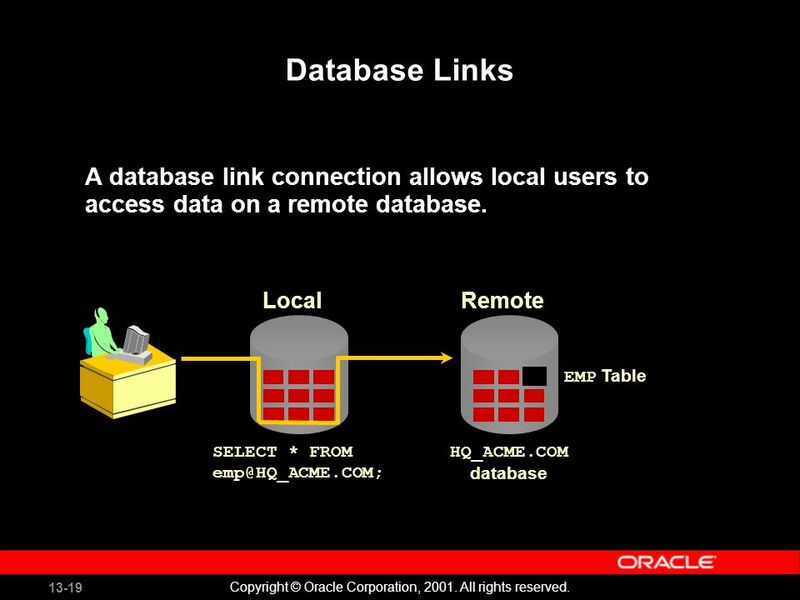 Introduction to Relational Database Systems 1 Lecture 4. 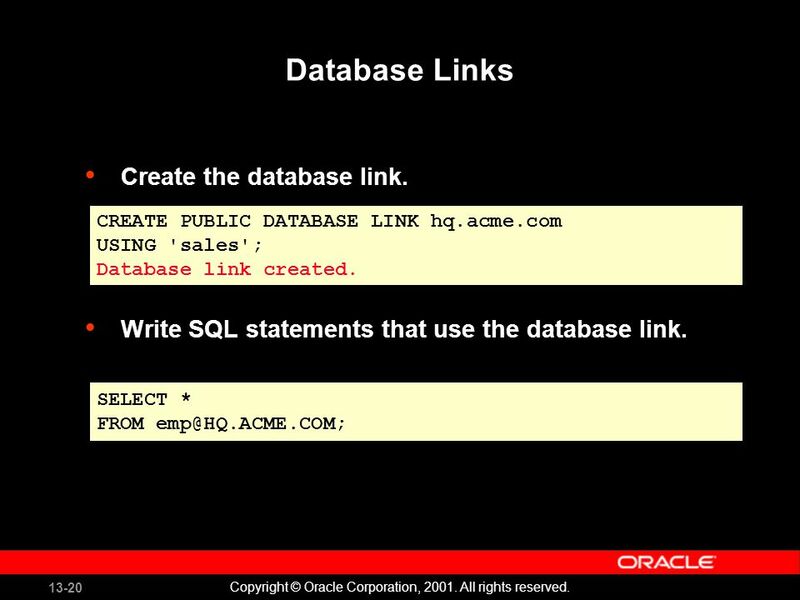 Dr. Alexandra I. Cristea CS 252: Fundamentals of Relational Databases: SQL5. 11 Copyright © Oracle Corporation, All rights reserved. Managing Tables. 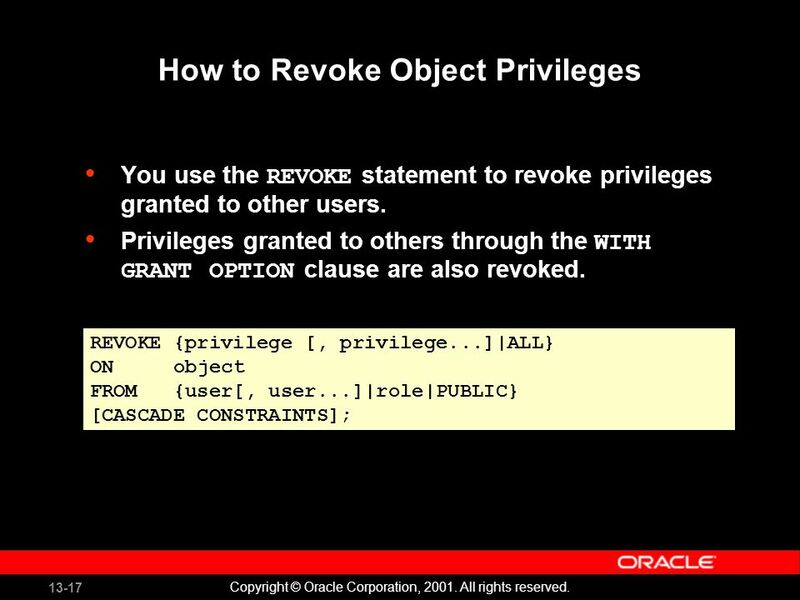 9 Copyright © 2004, Oracle. All rights reserved. 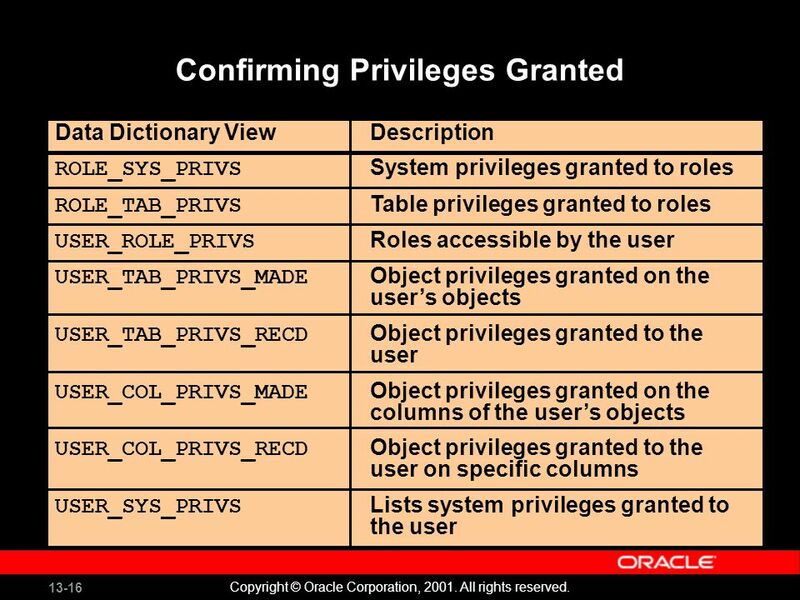 Using DDL Statements to Create and Manage Tables. 9 Creating and Managing Tables. 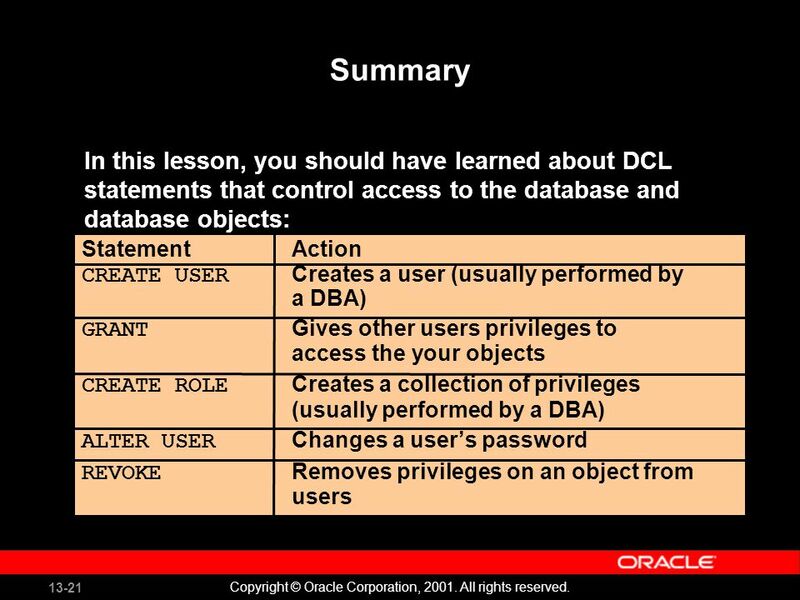 Objectives After completing this lesson, you should be able to do the following: Describe the main database objects Create. Creating Tables. 2 home back first prev next last What Will I Learn? List and provide an example of each of the number, character, and date data types.